Wow, your GOLDEN girls are unbeatable 🙂 Congratulations!! … so impressive to watch!!!!! Since I love handling analysis, could you explain why on the course where Le got best time of all jump heights ( 🙂 way to go wee girl!) you did a blind after chute jump for everyone except Bi? Do you think the FC with Bi cost you that bar? or was that just a hard distance for Bi? Oh and for us US people…what is that BEEP in the finals? was the final based on two small courses..best combined time? or were those elimination rounds? Congrats on such an impressive showing. With Bi, I do less blinds as she knocks more with blinds as with fronts… But she knocks with FCs too 🙂 Here, I think it was a combination of slipping after the chute + late FC. We normally don’t start on a beep either 🙂 but on this trial, in finals, there were two dogs at the same time running the same course and you had to start after the 5th beep (that’s when the time started). 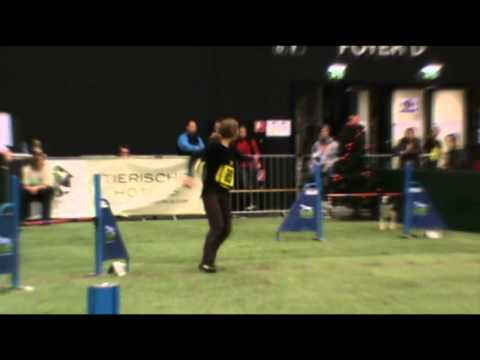 It was very stressful for me, I prefer to focus on a dog as to count beeps 🙂 I started too early a couple of times, one time is on a video (with Le), but you got additional 2s for early start (+ your time started as you crossed the line, not after 5th beep) and she was still fast enough to win with that extra 2s 🙂 We ran each of the two courses like 5+ times as you ran against another dog and then the winner ran against the winner of the next pair etc. so those of us who got to finals ran it many times, but I don’t have it all on video (nor want to bore everybody with it 🙂 ). Ha Ha…I was thinking that I certainly would be stressed listening to that beep! Now knowing you had to count too…the heart rate would surly spike. Very interesting way of running a competition that we don’t see here. Thanks for the explanation. I can watch this video a thousand times…it is so amazing to see somebody reach that level with 4 different dogs of 2 different sizes…Respect! I think Le learned it already… And started to cheat 🙂 I LOVE running with 4 dogs -- at least one will do great 🙂 -- But I sure did lots of running in those finals… I think I ran something like 40 times! NOT easy to warm up and cool down the dogs! Silvia, I didn’t realize the rules were so different than ours…. with the beeps and the run offs! I wish we had run offs for finals over here! Anyway, I am totally impressed and in awe of your threadles….. awesome! something strange going on with the comments….. getting warnings??? Hm, I don’t see it… Tried to reset something, are you still getting the warnings? Hi Silvia, I’m getting these warnings too…but only when I’m logged in. Here’s a JPEG of what the above comments look like. Working on the problem right now! and then right after that, my post starts! Ahhh….. I see. I am hoping to pick up some threadle skills from you, for both Jimmy and Bode:))))) Even though we don’t see them that often here! Oh well, I see Italy ( my country ) always does is best to look unfair and biased 😐 usually just “people with power” behave this way, common people does not, but of course a bad behaviour from somebody with a important role is noticed more. I suppose it was the Trofeo Frontline in Monza, right? I’m sorry they were so unfair with you! Oh, and last question: what about your other website? Don’t you update it anymore? Yeah, one website is keeping me busy enough… And I like this one as it’s more interactive.